When you start to execute your search, you should consider the key concepts in your research question and think about which words and specific keywords can be used to describe each of them. Choosing the right keywords is essential to receiving satisfactory search results, because the search engines cannot know what you are thinking, but simply match specific keywords assigned to each article. The right keywords will match and activate a numerous synonyms for the concepts you are exploring. The keywords are generated for a given database, e.g. PubMed, Embase and PsycInfo ans assigned to the individual articles from finite lists of keywords by trained subject specialists. The finite lists are also called a controlled vocabulary. In databases such as PubMed, you will only be searching in a limited database entry containing the title, abstract, journal name, etc. of articles whereas search engines such as Google Scholar search in the entire text of the article. 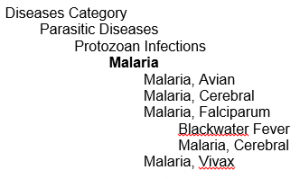 The keywords are organised in a tree structure, which branches down and becomes more and more specific, as shown below using the Mesh term “Malaria” in PubMed. Usually there are approximately 10-12 keywords assigned to an article. 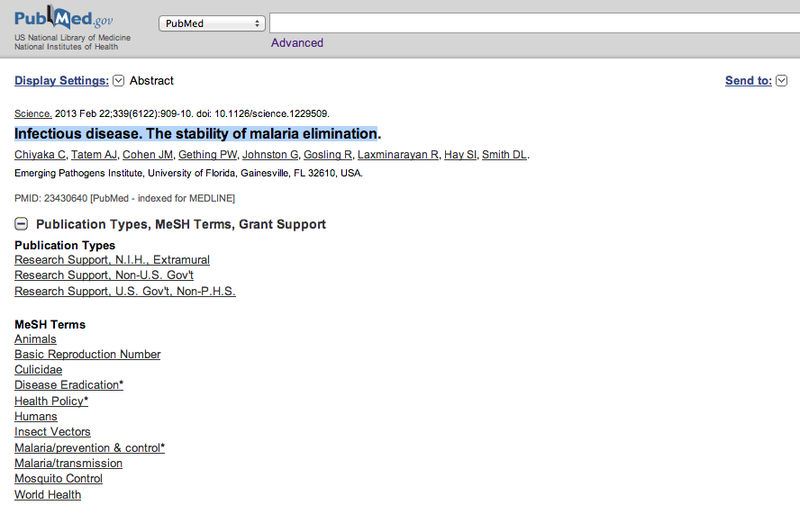 Keywords marked with a star (*) mean that the article is mainly about that topic. Searching with keywords can be very useful to focus your search if you have too many results. But be aware that keywords are manually assigned, so if you limit your search to keywords only that you will not find the newest articles that are waiting to be assigned keywords. ... that not all databases use controlled vocabularies as keywords – for example Web of Science uses KeyWords Plus® which are computer generated keywords created from words that frequently occur in the titles of an article’s cited references. In other words they don’t necessarily say so much about the article itself, but rather the articles that it has cited. ... that in PubMed the keywords are called Medical Subject Headings (MeSH) whereas in Embase and PsycInfo they are simply called Subject Headings.